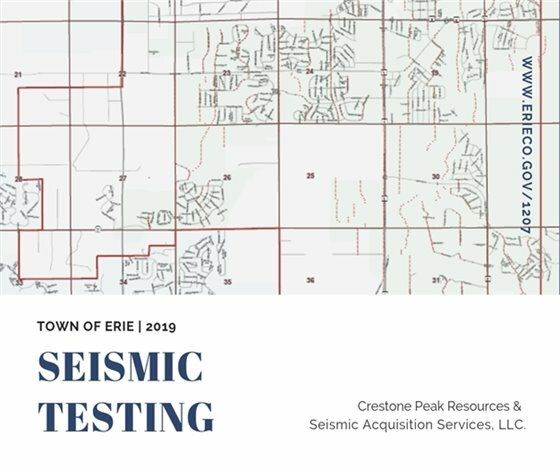 Crestone Peak Resources is partnering with Seismic Acquisition Services, LLC. (SAS) to conduct a 3D seismic survey to safely and efficiently develop oil and natural gas in the area. Seismic data allows scientists to identify the rock formations that have the characteristics required to hold oil and gas. By using this technology, scientists are able to reduce the industry footprint and maximize production from individual wells. Seismic data is collected when the environmental requirements and weather conditions permit. Usually, it is done 9 a.m. – 3 p.m. in residential areas. Door hangers will be distributed 24-72 hours in advance to the areas where vibe trucks will be operating. The Crestone/SAS Acme/Vessels Minerals project is planned to begin in mid-February and be done by mid-March. Copyright © 2018 Town of Erie. All Rights Reserved.